The veteran rider, a mainstay on the NYRA circuit since 2001, became the 34th rider in North American history to reach 5,000 wins. Pat On the Back, expertly piloted by Dylan Davis, powered to the lead at the top of the lane and held off a late rush from Can You Diggit to capture the featured $300,000 Empire Classic Handicap. The 4-year-old Congrats chestnut was able to turn the tables on the runner-up who had prevailed by a neck in the Evan Shipman on August 20 at Saratoga. Trained by Jeremiah Englehart for owners Harold Lerner, AWC Stables and Nehoc Stables, Pat On the Back settled comfortably in third position under Davis as Sea Foam and Mr. Buff battled through a quarter-mile in :24.46 seconds and the half in 47.94 seconds. Davis urged Pat On the Back into contention through the turn and quickly put away Sea Foam, setting up a brief tussle with a stubborn Mr. Buff. Pat On the Back outmuscled Mr. Buff and surged home a 1 1/2-length winner as Can You Diggit rallied in vain. Pat On the Back, a Silver member of the Loyalty Program, covered 1 1/8 miles in 1:49.76. Sent to post as the 2-1 mutuel favorite, Pat On the Back returned $6.50 for a $2 win wager. It was the sixth career win for Pat On the Back, all with Davis in the irons, and fifth stakes score for the colt having previously captured the Aspirant and Sleepy Hollow in 2016; the Ontario County in 2017; and the Saginaw in July. “This was a great way to end a fantastic day. This horse belongs to Dylan, he just knows the horse so well and it showed again here today with the effort he gave,” said Lerner. “Initially, this horse was with Kenny [McPeek] and we transferred him to Jeremiah, thinking he would get more opportunities to run in races like these versus state-breds. One race before the Empire Classic, Bonita Bianca prevailed as the 5-2 favorite to take the $250,000 Empire Distaff Handicap for fillies and mares by an impressive six lengths for trainer Jason Servis and owners Michael Dubb, Bethlehem Stables and Michael Imperio. Ridden by Jose Lezcano, the chestnut filly by Curlin broke from the outside 12 post to navigate an overland trip. After tracking English Soul's early fractions of 23.71 and 47.23 in the 1 1/16-mile contest, Bonita Bianca made a sweeping, four-wide bid through the turn to hit the stretch in front and kick clear through the stretch. Split Time put in a serious late run through the final quarter-mile but was no match for the winner, who galloped under the wire. The final time was 1:43.18. Bred by Dormellito Stud, Bonita Bianca returned $7.50. Tiznow's Smile finished another 1 ¾ lengths back in third. Highway Star kicked off the day's stakes action in Race 2 with a dramatic rail-skimming victory in the $150,000 Iroquois for fillies and mares 3-years-old and up. Facing fellow state-breds for the first time since finishing second by a nose in the Critical Eye on May 28, Chester and Mary Broman Sr.'s multiple graded stakes winner bested a field of eight to earn the victory. Sent off as the 2-1 post-time favorite with David Cohen aboard, Highway Star, a Silver member of the NYRA Loyalty Program, stumbled at the start and stalked early along the rail from seventh-position. Finding a narrow opening at the top of the stretch, Highway Star powered up the rail and held off the closing Satisfy to win by a neck at the wire. Her final time for the 6 1/2-furlong distance was 1:16.08. Returning $6.80, the 5-year-old daughter of Girolamo bred by her owners and trained by Rodrigo Ubillo, picked up her first victory since winning the Grade 2 Gallant Bloom Handicap in September 2017 at Belmont. In Race 3, Offering Planprovided Castellano's second win on the card and 4,999th of his career, delivering as the 6-5 favorite with a romping, six-length victory in the $200,000 Mohawk at 1 1/16 miles on the Widener turf. The 6-year-old son of Spring At Last was kept in midpack behind dueling frontrunners Mo Maverick and Black Tide, who set swift early fractions of 22.94 and 46.36. Given his cue in the far turn, Offering Plan began to usurp rivals in the far turn. The Chad Brown trainee assumed the lead at the top of the stretch and pulled away easily to stop the clock in 1:42.01 over the turf course labeled good. He paid $4.70 to win. Rapt was second. It was the eighth lifetime win from 23 starts through four seasons of racing for Offering Plan, bred by Swann and Cygnet Farm and owned by Michael Dubb, Nantucket Thoroughbred Partners, Bethlehem Stables, and Gary Aisquith. A Silver member of the NYRA Loyalty Program, Offering Plan hasn't been off the board in six starts this year, including near-misses against New York-bred company in his last two races, the West Point on August 24 and the Ashley T. Cole on September 23. Runaway Lute, trained by Gary Contessa for Harold Lerner and Nehoc Stables, was urged to the lead out of the gate by Castellano and never looked back as the popular jockey secured the landmark win in the $150,000 Hudson Handicap. Sent to post at odds of 5-1, the dark bay son of Midnight Lute, bred by Windylea Farm, marked the half-mile in 46.18 seconds with Eye Luv Lulu and The Caretaker tracking his early foot. Runaway Lute opened a 2-length advantage at the top of the lane and dug in gamely to hold off the rallying Gold for the King by a diminishing three-quarters of a length. Runaway Lute, who paid $13.40 to win, covered 6 1/2 furlongs in 1:15.70. In the $200,000 Ticonderoga carded as Race 5 on the inner turf course for fillies and mares 3-years-old and up, Peter Brant's Fifty Five picked up her second consecutive added-money score since taking the John Hettinger on September 23. Breaking from post 7 as the 4-5 post-time favorite with Castellano aboard, Fifty Five settled comfortably in sixth-position as Lovely La La led the field of seven through fractions of 24.02 seconds for the opening quarter and 49.12 for the half. At the quarter-pole, Lovely La La faded from contention as Fifty Five was guided to the four-path hooking up with La Moneda in late stretch. All out to the finish, Fifty Five pulled away at the sixteenth-pole to secure the victory by one length at the wire. She completed the 1 1/16 miles distance in a final time of 1:42.21. Returning $3.60 for a $2-win wager, the 4-year-old Get Stormy filly, bred by Empire Equines LLC, picked up her third win of the year and back-to-back victories in the Ticonderoga for winning trainer Chad Brown and Castellano. Fifty Five is a Silver member of the NYRA Loyalty Program. Surge of Pride pulled off a successful switch to the main track with a 1 ¼-length win in the $250,000 Maid of the Mist for 2-year-old fillies at a mile for owners Grey Fox Stable and Chester and Mary Broman and trainer Linda Rice. Opening her career with a pair of races on the turf, the Bromans-bred Kantharos filly made solid use of her dirt debut, saving ground under Junior Alvarado near the back of the pack as 5-2 favorite Cartwheelin Lulu held a narrow lead through early fractions of 23.31 and 47.70. Surge of Pride continued to advance into contention up the backstretch. Alvarado swung his charge outside a wall of horses near the quarter-pole. She responded with a strong close down the middle of the track to run down Elegant Zip in the final strides for her first stakes win. Surge of Pride returned $33.20 to win. Kept True was third, two lengths ahead of Maiden Beauty in fourth. In Race 8, Barry K. Schwartz and Andrew Rosen's homebred Bankit stalked the pace, made a strong move from the outside and was geared down at the wire in a 5 ¾-length win in the 22nd running of the $250,000 Sleepy Hollow for 2-year-olds. Bankit, a Silver member of the NYRA Starter Loyalty Program, notched his second career win in five starts and first career stakes victory. The Central Baker colt stayed off Dugout's early fractions of 22.88 seconds for a quarter-mile with the half in 46.57. Out of the turn, Bankit, under jockey Irad Ortiz, Jr., surged from the outside to take command and outkick a charging Bustin Hoffman, completing one mile in a final time of 1:37.69 on the fast main track. Off as the 5-1 choice for Hall of Fame trainer Steve Asmussen, Bankit, whose previous best stakes finish was second by a neck to Dugout in the Funny Cide on August 24 at Saratoga, returned $12.40. Strive for a Cure, making his stakes debut, finished in third, 1 ¼ lengths behind Bustin Hoffman. 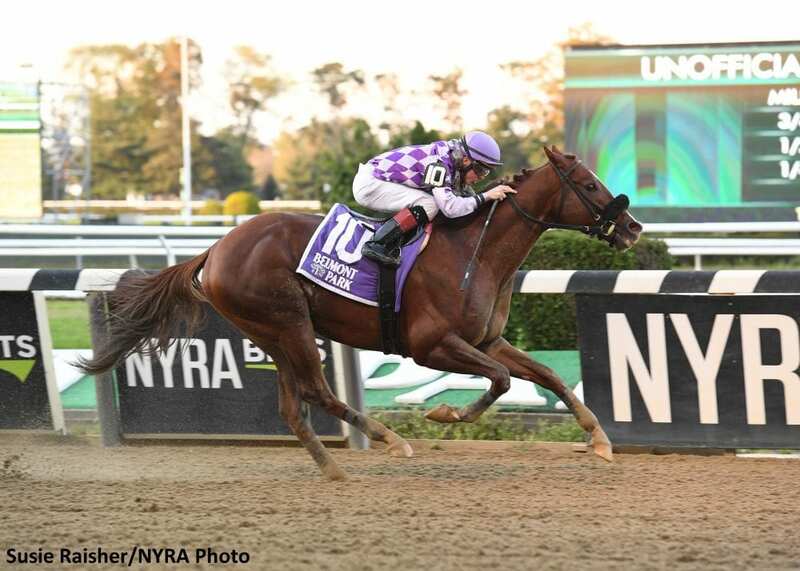 This entry was posted in Racing and tagged belmont, belmont park, bonita bianca, Congrats, dylan davis, empire classic, empire showcase day, harold lerner, hudson, Javier Castellano, Jeremiah Englehart, New York breeding, new york-bred, pat on the back, runaway lute by NYRA Press Office. Bookmark the permalink.